Identity Force offers an impressive range of services to help you identify risks, protect your identity and restore any damage that has been done by identity thieves. As budgets vary, it offers two competitively-priced membership packages, "Ultra Secure" and "Ultra Secure + Credit", payable on either a monthly or yearly basis. The first package, “Ultra Secure”, comes with a 14 day free trial to help you learn about the system and work out whether it can offer what you’re looking for. This package provides several systems for monitoring your personal information, checking illegal sites that deal in such information, as well as public records. It then alerts you if your information is being misused, allowing you to take any necessary action to prevent further damage being done to your name. What is particularly good about the "Ultra Secure" package is that, unlike some competitors, it also includes a recovery service. Essentially this means that if your identity is used fraudulently whilst you are under the protection of Identity Force, their specialist team will work to restore your identity, saving you hours of effort in filling out forms and making calls. The second package, "UltraSecure + Credit", is designed for those of you looking for more control over your personal credit information. With this pacakge you will receive daily 3-bureau credit monitoring, credit reports and credit scores, as well as a monthly score tracker. It costs approximately $50 a year more than the basic UltraSecure package. Identity Force also offers a ChildWatch service as an optional add-on, which can be important if you are interested in protecting the identities of your children. Most people secure valuable possessions, such as cash, jewellry, cars and homes. But when it comes to one of our most valuable possessions, our identities, some people don’t take the proper steps to make sure that it isn’t at risk from theft. If someone manages to steal your identity from public records, your online information or even using information that they’ve found in your trash, they may be able to access your finances or even make claims in your name. Criminals are thinking of ever-increasingly sophisticated and devious ways to use someone’s identity for their own benefit. What is particularly good about the "Ultra Secure" package is that, unlike some competitors, it also includes a recovery service. We have briefly covered how this service protects your identification from theft through monitoring the internet and public records, but what if the worst happens and your identity is used for fraudulent purposes? Well, IdentityForce does offer a $1 million nation-wide insurance policy which will cover costs incurred, such as lost earnings. It may be useful to request the specific details of this policy, however, to make sure that it will cover you for the possible issues and costs you might face. Beyond the monetary problems you could inherit, the company also employs specialists who can respond rapidly to your security breach in order to reduce its impact on your life. This includes a rapid response toll-free hotline and regular updates on their progress. The aim is to reduce any black marks against your name and credit in the hope that you shouldn’t encounter any problems from the breach in the future. If you’re hoping to make investments, apply for jobs in which background checks are carried out, or even if you’re looking to move house or buy a new car, this can be very important. In terms of information and help, the site provides live chat (good to see as it’s so often missed, but is vital if you need to speak with a member of staff immediately but don’t have access to a phone) and a range of information through its blog and FAQ. A unique feature of its resource center is an online quiz, which tests your understanding of identity theft so that you can identify areas of weakness. It also holds occasional competitions in which you can win coupons or even an iPad mini. IdentityForce.com sits on the greener side of pricing in comparison to its competitors. Whilst its year-long contracts don’t offer a massive saving (approximately 17%, or 2 months free) over its month-by-month packages you still do save some money. Plus if you do decide you only want the service for a month or two then you don’t lose out a great deal compared with taking out the longer contract. Another way that the site could deal with its prices is to offer a greater variety of packages with optional extras so that customers could customize their contract to suit them, but few sites offer a wider variety of package options. 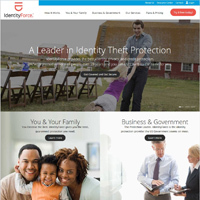 Everything taken into account, IdentityForce offers a very strong service at all levels of preventing identity theft. It monitors potential risks, warns you about them, attempts to prevent them and then helps you to resolve any issues. The variety of features and level of service on offer places it above its peers whilst still offering its services for a highly competitive price. Since the site offers a 14 day free trial, you’ve got nothing to lose.